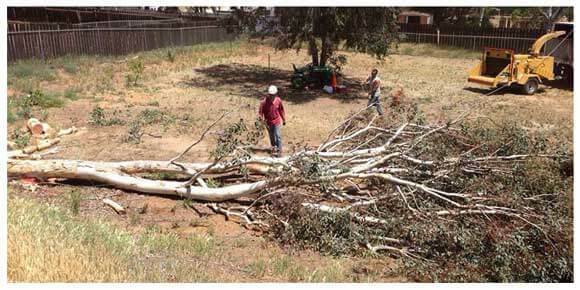 Expert Tree Removal in San Diego County by Estates Tree Service. 🌳Industry’s Best Tree Removal Techniques. The Highest Quality, Most Affordable, Tree Removal Services in Poway, El Cajon, Santee, La Mesa, Escondido, Vista and surrounding areas. Tree Removal from Estates Tree Services, we provide free no obligation estimates and serve all of San Diego County. If you have a tree that you need to have removed from your San Diego home we can help! We have an 80ft boom truck and can provide Tree Removal for trees of all sizes. While Estates Tree Service is in the business of taking care of trees and ensuring that they have a long, healthy and safe lifespan, we understand that at some times tree removal is necessary to ensure that your property remains safe from diseased trees or tree related incidents during storms. Our crew is highly skilled and well prepared for a Tree removal of any size, we offer completely free estimates for all of our services so if you have a tree that needs to be removed give Estates Tree Services a call today. The Importance of proper Tree Removal Services. Tree Removal Services can at times be very dangerous to both people and property, hiring an experienced and insured Tree Removal Company like Estates Tree Service is essential to ensuring that your next Tree Removal goes smooth. When our crew gets started on a tree removal project, we always take all of the proper precautions before we begin our work. We start by evaluating the trees position in relation to structures, cars, electrical lines and any other object that may become a hazard during our job, after the surrounding area has been fully evaluated our crew will create a plan that will ensure everything in the area remains safe. We then begin removing the tree little by little, this allows us to keep everything safe and using this method ensures that nothing unexpected happens during the tree removal. Depending on the scope of the job like the size of the tree and proximity to structures a tree removal service can take anywhere from half of a day to multiple days. All of these items will be taken into account when we evaluate the tree removal cost and provide our 100% free, no-obligation written estimate. Once the service is completed you can have the crew at Estates Tree Service chop your old tree into firewood, chip your tree for mulch or haul it all away. Emergency Tree Removal Services Are Available Throughout San Diego. Estates Tree Service is here when you need us! If you have a tree on your property that begins to threaten a structure, car, power line or anything else it should be removed immediately, failure to do so may result in thousands of dollars in damage. We offer 24/7 tree removal services if you should find yourself in an emergency situation. Just because we are available during the odd hours does not mean that we will raise our rates, we pride ourselves on helping our neighbors in San Diego, this means providing high quality and affordable tree removal services all of the time. Call Today for a Free Written Tree Removal Estimate for Commercial or Residential. 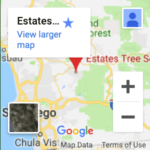 No matter where you are in San Diego County, Estates Tree Service will come to you at no cost to evaluate the needs of your property and your tree removal job. No matter the type of tree, Palm Trees, Oak, Pine, Eucalyptus, or your location our on-site estimate is free. When you hire Estates Tree Service for your Tree Removal in San Diego, you are hiring the best company for the job. We have 25+ years of experience, we are licensed, insured and BBB A+ Rated. Unsure if you need Tree Removal? Many homeowners are, there is nothing to worry about. We will also provide you with information on how you may be able to save your tree from removal with Tree Trimming Trimming San Diego, support, and care services from Estates Tree Service you may be able to save your tree before it becomes a hazard. Are you worried your trees may need to be removed due to a Bark Beetle infestation? Prevention and treatment is possible. Take a look at this informative blog post for more information. You may also be interested in our San Diego Stump Grinding Services.